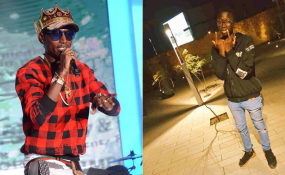 A Nairobi family has pointed an accusing finger at rapper Henry Ohanga, popularly known as Octopizzo, over their teenage son's death on Saturday. The family of 19-year-old Kenneth Abom suspects the rapper injured their son on the head during a scuffle at his house earlier last week. Complications from the injury might have led to the boy's death, the parents suspect. But speaking to KTN, the rapper denied the allegations, saying that Kenneth broke into his house last Thursday. According to neighbours, the rapper was seen pursuing the boy from his house but he was immediately told to stop because Abom lived in the estate. Speaking on the phone with KTN, Octopizzo said; "No, I did not hit the boy. His father was the first person I talked to after the incident. I did not know why he came in my house. An hour later, we heard that the boy dropped from the fourth floor," Octopizzo said. According to the deceased's brother, Mr Paul Abom, Kenneth came running to the house which is on the fourth floor with a cut on the right side of his head and a blood-stained shirt. "He went straight to the bathroom to clean himself up and the next thing we knew he had jumped through the window to the ground," said Paul. "He was rushed to Nairobi Women's Hospital and then referred to Kenyatta National Hospital where doctors [said] that he would recover," Paul said. His father, Mr Aggrey Abom, said his son seemed to be recovering well on Friday but on Saturday at around 10am, he succumbed to his injuries. The father denied the rapper's claims that he had spoken to him. He suspects that his son might have been hit by a blunt object because he had a cut on the right side of his forehead. He added that his son, who they said had an interest in music and arts, might have been curious after Octopizzo moved in the neighbourhood recently. The family said that they are waiting for autopsy scheduled for Monday.